Turkey hunting is about patience and confidence. You have to be confident that no matter how long you’ve been calling, listening, walking, hiking, wading, and sometimes crawling, just around the next bend your entire hunt can change. Likewise, patience fights discouragement by reminding us that every hunt will not end with a trigger pull. With that said, there are those magical moments when a half hour after we climb out of the truck we are walking back out with a shotgun containing two shells in our left hand and a gobbler over our right shoulder. The flash hunt, as many in the brotherhood like to call it, is the rare, but oh so sweet experience when five shot flies and feathers flop with little or no effort, energy, and last but not least, patience. These short flashes of success tend to make up for all those days when the mosquitoes are blood thirsty, the hills are steep, and birds are silent or all together missing in action. A flash hunt I experienced with a buddy this season during the first few days of the Alabama season reminded me of a few things worth noting, especially if I’d like more flash in my future. First, flash hunts do not happen where there are no turkeys. Even those mornings when everything seems to come together depends greatly on having huntable populations of birds in a given area. I’m sure somewhere there is a guy who will stumble upon the only gobbler within five miles of his lease who happens to also be lonely and love sick. But this is, at best, very rare. My friend, Brandon McHugh from Selma, Alabama knew the land we were hunting well and had pinpointed within a few acres exactly where the birds would be roosted. Lesson? Scouting and knowing where the birds can increase your likelihood of a flash hunt. Second, if we are honest, most flash hunts depend on a just a few things going our way. Brandon and I walked into a beautiful hardwood flat about fifty yards wide, sandwiched perfectly between an agricultural field and a respectable creek on its way to the Cahaba River. Even in the moonlight, the moment our boots hit leaves I noticed the scratching everywhere. Brandon, knowing how turkey hunters think, could tell I was getting nervous. The woods are still winter naked and I did not like tromping in an area full of birds that was so open. He assured me that they always roosted about 300 yards down the flat, so we eased closer. Arriving at the edge of the “red zone” we decided to go ahead and set out the strutter decoy and I tucked a hen decoy right up under it since we’d already seen some breeding on previous hunts. We nestled down at the base of a big dark oak and waited for the birds to wake up. We were caught off guard when a jake half gobbled 40 yards behind us just over the creek. How in the world he did not see us I’ll never know. Next a deep, long gobble fired back in the direction from which we came. We had to have walked right under him. At least nine out of 10 times those turkeys would have spooked, but for some reason they didn’t. Lesson? Sometimes things just work out. Why is this lesson worth noting? I’ll tell you why. Because often they don’t work out and in those moments when you have messed up royally and your hunt is over be mindful that it is not always that way. 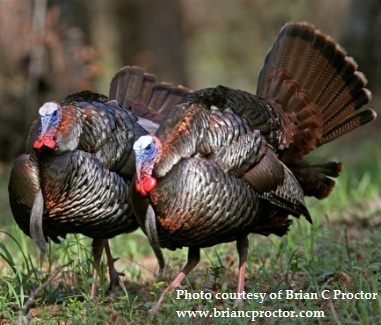 Like most things worth pursuing, turkey hunting rewards us just enough to keep us coming back. Finally, even flash hunts require restraint and patience. With no calls in our mouths, face masks down, and guns laid in our lap we went into slow motion mode. As if I wasn’t nervous enough, when a hen started soft yelping near the jake, I knew we were toast. We couldn’t call, move, and I was even trying not blink. What did we do? The only thing we could do, nothing, and doing nothing was the difference maker. The third and fourth gobblers to sound off were actually where we expected all the birds to be. The jake and hen on our shoulders made calling risky. Even light clucks or yelps were not going to work until they flew down and lost their tree top perspective. The longbeards down the creek gobbled three more times but the last one sounded suspiciously low. I whispered to Brandon that I thought they may have pitched down. The worst case scenario at that point was if all the birds join them, they move off, and we let them go until we have the cover and ability to call them back. Best case scenario…well that’s why this is a flash hunt. Apparently, our friend the jake and his little sister were all they needed. I looked down the flat to my left and smiled when I saw a dark circle with a white head in the center marching our way. The blob became two blobs and as they got closer and daylight reached further into the timber I made out full fans and long beards. While I was peering at them they spied the strutter and it sealed their fate. I whispered to Brandon that our brothers had arrived. Sitting on my right gave him no shot so we quickly decided that I would shoot the strutter and then get small. I squeezed off the shot, flipping number one. As I leaned back out of Brandon’s way, in an instant, he swung around and picked up number two, who had jumped, landed, and was on his way out but had made the mistake of stopping to take one last look at his compadre. My buddy’s red dot found a white head and two gobblers were down before most birds had left the tree. Lesson? The restraint to do nothing kept us in the middle of the action. So, even flash hunts require short bursts of patience. If it’s any consolation, the rest of my week hunting my home state before returning to my current home in South Carolina was not nearly as eventful. Gobblers with lots of hens filled my mornings and we all know how that usually goes. But my early season flash hunt was just enough to keep me coming back. D.J. Horton pastors a church in Spartanburg, South Carolina. He is a native Montevallo, Alabama and began his love affair with turkey hunting while attending Auburn University. His passion for turkey hunting is as much about the people he hunts with as it is the beards and spurs he collects.